I have been a very quiet blogger lately, but it has been a bad winter and I am just getting over a very bad bout of flu which ended up as Strep Throat. I still have a bit of a cough and my energy levels are non-existent, but I am getting a bit better everyday. So a lot of sitting and planning sewing has happened and very little actual sewing. 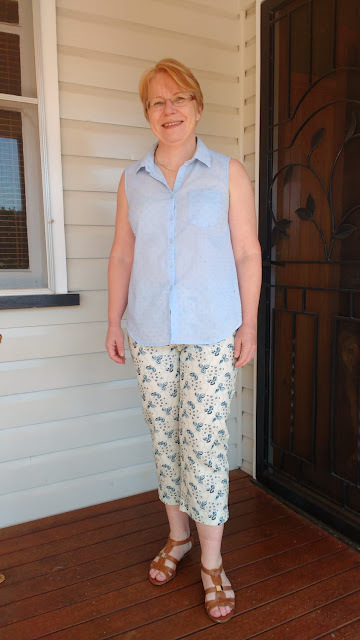 I did get a little inspired by the Pattern Review Sewing Bee and thought I might enter, but my energy levels did not match my enthusiasm so I didn't get my entry finished in time, but it has inspired me to make some capris. So far I have a muslin made from the Ottobre pattern 02-2011-10. The muslin fabric is similar in stretch to the fabric I want to use and is a little lighter in weight, and is one of those... what was I thinking fabrics! So, you know about perfect for a muslin! 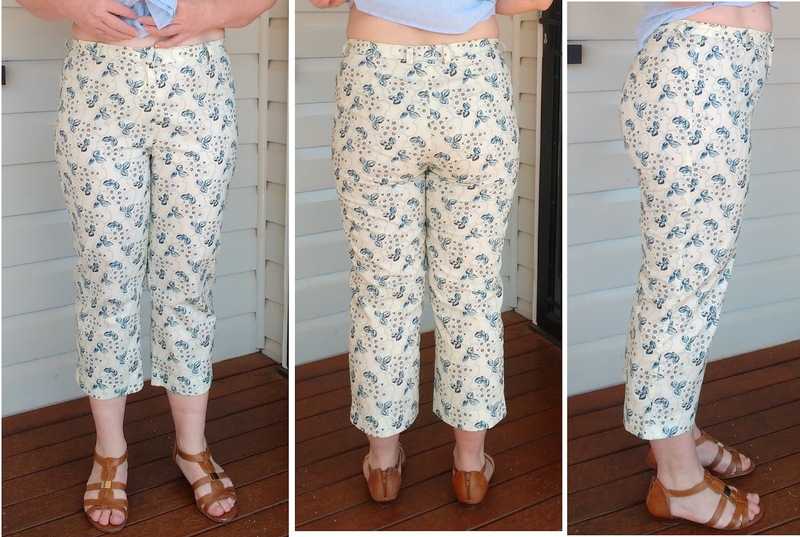 I took so long to make these as I really am not a fan of making pants and I have never found a fly tutorial that is really simple to understand... until now! I used the instructions found in the Palmer Pletsch "Pants for Real People" book. I will follow the instructions again when I make my real pair and I think it will be my go-to fly instructions now. What do you think of the leg length? Should I make the next pair a little shorter? 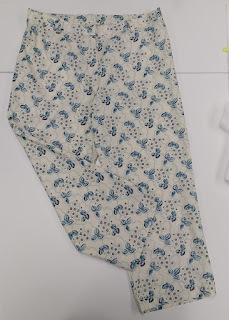 The boo-boo I made on these pants was to trim off the underlap in line with the edge of the fly... so I did not have enough overlap to sew a button/buttonhole to the waistband... duh! I obviously don't do flys/waistbands often enough! I have just sewn a hook and eye to hold the waistband together. It has been noted in my pattern now, so hopefully I won't do that again next time. I am very happy with the fit of these pants. 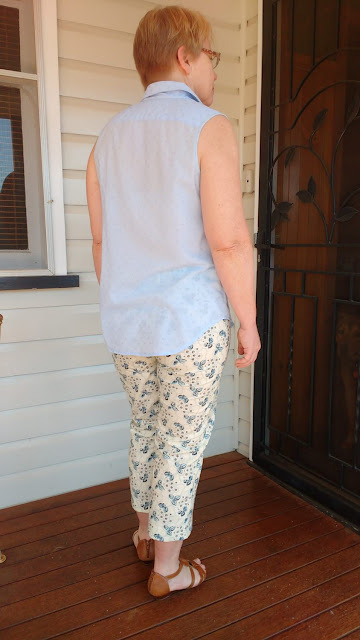 I thought I might need to add some fabric to the inside leg front as they felt a little tight when I first put them on, but on wearing them the fabric has relaxed enough that I don't think that it is an issue. 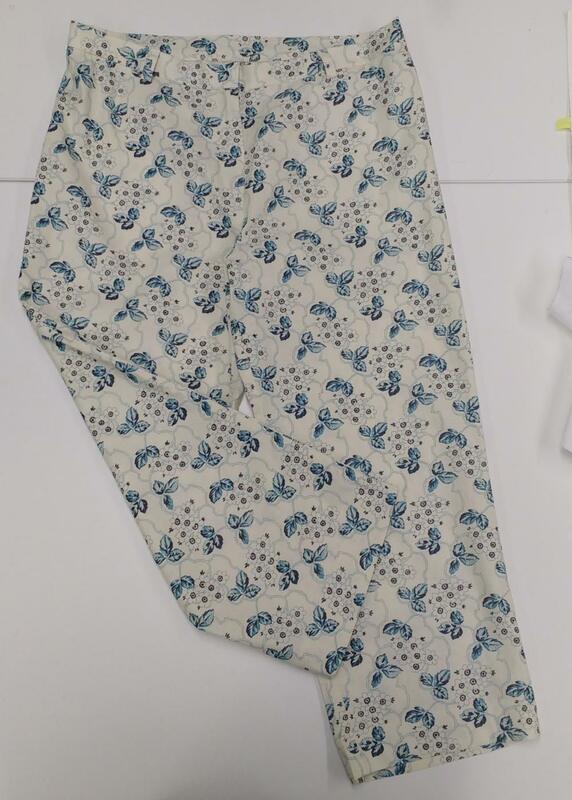 So this pair look a little grandma's sofa cover, but I think I will wear them a little this summer just to make use of the muslin. My "real" pair are going to made in a camel/tan fabric that I think will work into my wardrobe really well. The fit looks really great Sue. I hope you get better energy levels soon. It's a drag to not feel well and not get stuff done. Glad you are starting to feel better. The pants look good. I agree with Summer Flies, the fit looks really good. I have had days like that too where I'm not feeling well and my creativity bug is gone. Glad your feeling better. My sympathies about that flu thing since I lost three weeks with it in late spring. Nice that you are following the bee even if just for your own wardrobe. Here's to feeling better! And the pants look great! I'm impressed by the fit!! Well done, I need to make some pants this length now that it is getting warmer!! The fit of these looks really great! I can relate to those fabrics, "what was I thinking." LOL However, these look really cute and summery with your top. Your pants looks very good and how about turning up the hem and seeing what looks best for length, I think it depends a lot on what you wear on your feet. Hope you are feeling better.